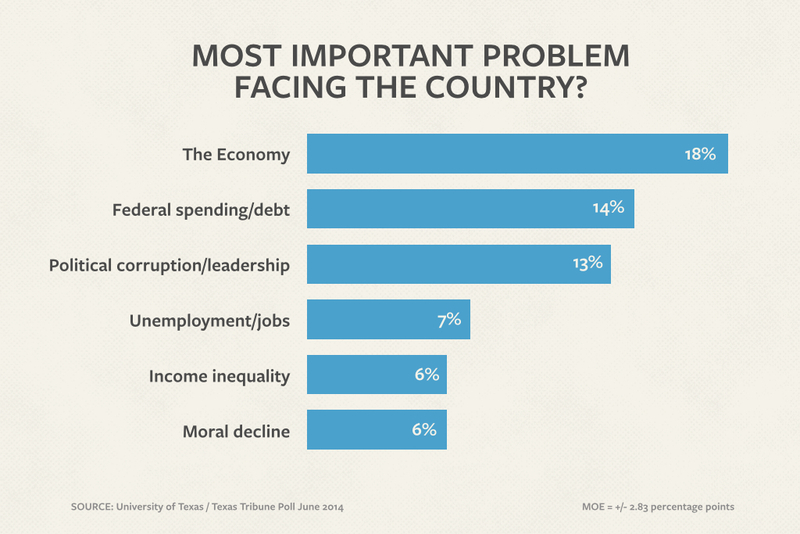 The economy and immigration are among the issues of most concern to Texas voters, but there are partisan concerns over leadership and corruption right under the surface, according to the University of Texas/Texas Tribune Poll. 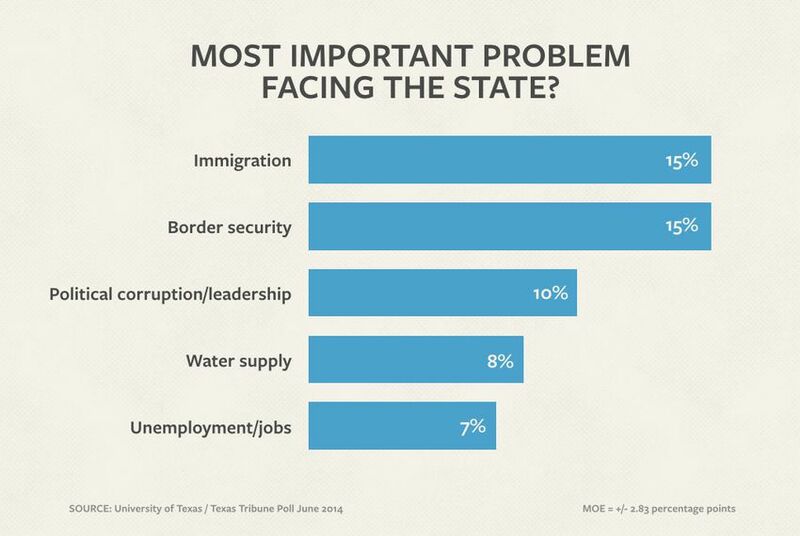 Immigration and border security are the two most important problems facing the state, while federal spending and the economy are the biggest problems facing the country, according to the University of Texas/Texas Tribune Poll. But political corruption/leadership has risen on both the national and state lists for reasons related to who is in office and which voters are unhappy about it. With a Democratic administration in place, 19 percent of Texas Republican voters rate public corruption and leadership as the most important problem facing the country; only federal spending and national debt outrank it on their list. Only 8 percent of Democrats put the leadership issue at the top. Their top issues are the economy and income inequality. But on the state level, where there is a Republican administration in place, political corruption/leadership is the top choice of Texas Democratic voters, with 20 percent of them choosing that as the most important problem. Only 2 percent of Republican voters have that atop their list; their biggest concerns at the state level are border security and immigration. Just over half of the Republicans in the survey name one of those two items as the top state problem. “The prominence of immigration and border security are almost entirely driven by Republican attitudes — 51 percent of Republicans cite immigration or border security, up 12 points from February,” said Jim Henson, head of the Texas Politics Project at the University of Texas at Austin and co-director of the poll. “We just spent months hearing about it in the Republican primary, and in very dire terms. Overall, economic issues dominate the national list, and immigration dominates the state list. One new issue that has ranked lower in previous UT/TT polls comes up fourth on the list of state issues this time: the water supply, ranked the most important problem by 8 percent of Texas voters. Asked which major-party candidate for governor would do a better job on a list of issues, the voters choose Republican Greg Abbott over Democrat Wendy Davis on each. Around a quarter of them — 23 percent to 26 percent — say they have no opinion about which candidate would do better. While Abbott is up on the issues in the poll, voters feel more strongly about some differences than others. Their strongest preferences for Abbott are on fiscal issues, with 49 percent saying he would do a better job on the economy and 28 percent saying Davis would do better, a difference of 21 percentage points. On taxes and the state budget, the Republican had a 19-point advantage over the Democrat. Davis is behind, but much closer, on public and higher education. 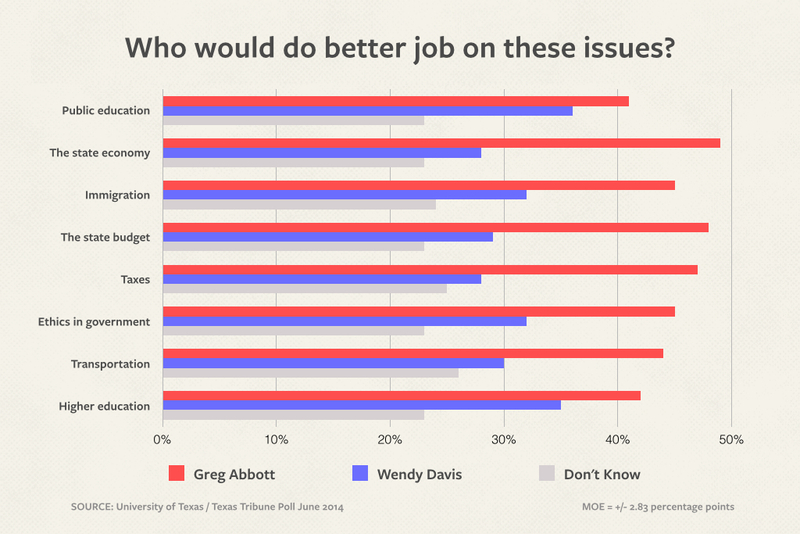 On the former, 41 percent say Abbott would do a better job and 36 percent say Davis would. On higher education, he has a 7-point advantage. This is the third of several stories on the latest University of Texas/Texas Tribune Poll. Thursday: The statewide general election races and a peek at the 2016 presidential primaries. Friday: Texans’ views on various officeholders and candidates, on the state of the state and the country, and on the Tea Party. Tomorrow: Texans’ views on a variety of education issues.